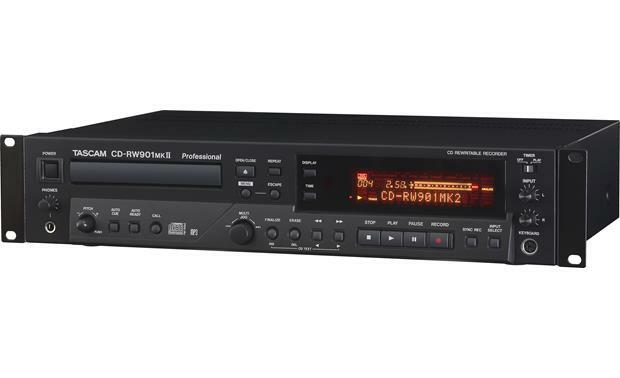 Get the all the connections and performance you need for your studio with Tascam's CD-RW901MKII professional CD recorder. This versatile recorder starts with the features offered on Tascam's CD-R900MKII CD recorder, including the new TEAC-designed tray-loading transport, then adds more capabilities designed for advanced professional recording. You get ISRC (International Standard Recording Code) writing during mastering, with a display that can check the data on a master disc after recording, as well as display the RID (Recorder Identification Code). The Overlap Recording Function allows you to connect two or more '901MKIIs together for making continuous, extended-length recordings without missing a beat. And this recorder offers a super-convenient index search function that lets you search for index markers within a track that were assigned during recording. 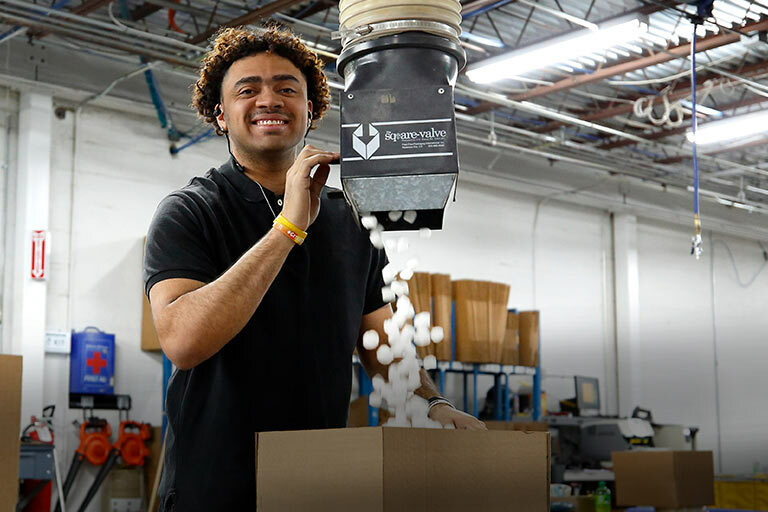 Along with its advanced features, the CD-R901MKII provides a wide range of professional connections. You get balanced analog XLR audio inputs and outputs for long, low-noise signal runs to compatible pro audio gear. Balanced digital XLR ins and outs are also provided for high-quality connections with digital mixers or processors. 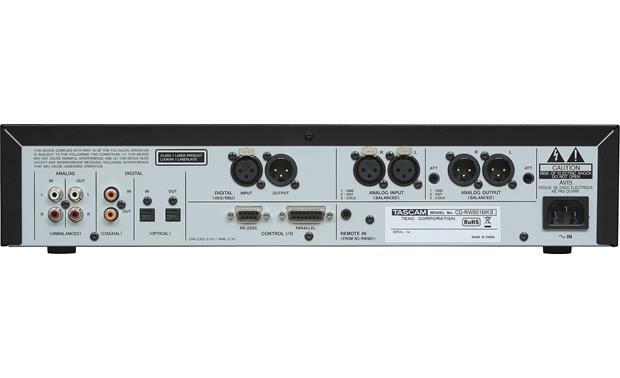 The recorder's RS-232C and 15-pin parallel ports provide control capability with various outboard master controllers. For monitoring or private listening, the CD-RW901MKII includes a headphone jack on the front panel with a volume control. And the included wired remote has number keys for quick access to a specific track. CD Recorder: The Teac CD-RW901MKII is a professional CD recorder with both balanced and unbalanced, analog and digital inputs/outputs for recording of your external audio sources. 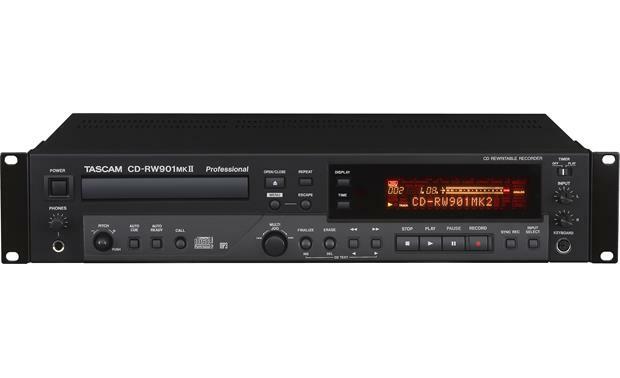 Whether used for PA/Sound Reinforcement playback, studio, mastering, or broadcast, the CD-RW901MKII offers reliable CD recording and playback. Disc Compatibility: The following disc type can be played back by the Teac CD-RW901MKII. Note: The CD-RW901MKII can recognize up to 255 folders and 999 files on a recorded MP3 CD-R/RW disc. 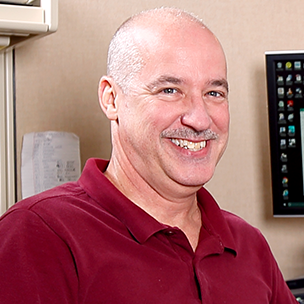 Balanced/Unbalanced Analog & Digital Connectivity: Balanced & Unbalanced analog, plus S/PDIF coaxial and optical connections are provided for connection flexibility. The CD-R901MKII features an unbalanced stereo analog RCA input and output, an unbalanced coaxial digital input and output, and an unbalanced optical (toslink) digital input and output. Balanced analog XLR inputs and outputs are provided for use with pro equipment or long signal runs. Balanced AES/EBU is also included for use with digital mixers, processors, and processing. Headphone Jack: The CD-RW901MKII also includes a front-panel 1/4" headphone jack for record monitoring and playback listening. Playback Functions: Even if you don't need to record every day, the CD-RW901MKII makes an excellent CD player. Functions including auto-cue, auto-ready, pitch control, program, random/repeat, and more are provided. Timer Playback: By using an external timer, you can set the CD-R901MKII to play the loaded disc automatically when the unit is turned on by the time. 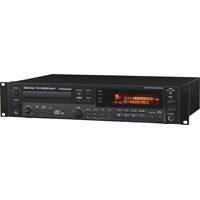 Track Division Functions: The CD-RW901MKII offers a variety of track division functions to make recording simpler. Overlap Recording: Continuous recording is supported when using two or more CD-RW901MKIIs connected through their parallel ports. An optional cable is available for two or three-machine recording setups. A selectable overlap of 30, 60, or 90 seconds can be switched on for the next recorder to find a better edit point. Synchronized Recording: Synchronized recording basically mean that recording will being automatically when a signal is received, and will stop when a signal ends. Titling: Titles can be give to recorded discs and tracks using the unit's Text Edit option. ISRC/RID Code: The ISRC (International Standard recording Code) written during mastering can be displayed. The CD-RW901MKII can check the data on a master disk after mastering. It can also display the RID (Recorder Identification Code). 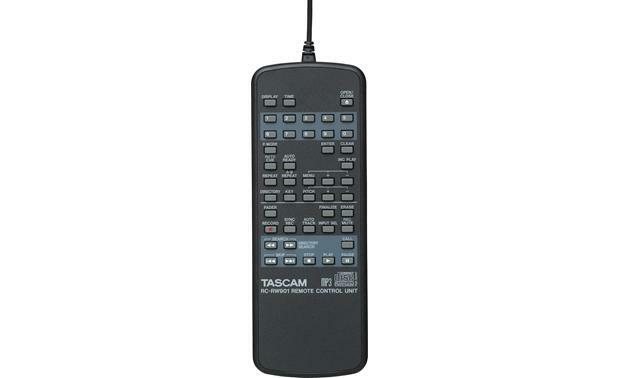 Wired Remote Control: The Teach CD-RW901MKII includes a wired remote for control of the CD recorder. The remote is powered by two "AAA" batteries (included). External Control Via RS-232C: The RS-232C serial and 15-pin parallel terminals make it possible control the recorders from various master controllers. It can be used with a fader-start signal in a broadcasting station, or with a centralized control terminal in a public facility. Mountable: Rack Mountable: The CD-RW901MKII comes out of the box with rack ears installed. The unit will fit into a 2U rack-mount space, however it is recommended to leave 1U of space above and 4" behind the unit for proper ventilation. If needed, the player's 4 rubber feet can be removed when rack-mounting. Four rack-mounting screws with rubber washers are included.